Timber trafficking is supported in this country by documents that contain false information: They declare non-existent trees in forest concessions and then justify their volumes by substituting timber extracted from prohibited areas. This illegal activity occurs in protected areas and the department of Santa Cruz. In San Carlos, a small town in Bolivia located 110 km from Santa Cruz de la Sierra, the main plaza looks peaceful. It is midday on a Tuesday in April and there is little movement in the streets. Lush vegetation is everywhere and from here you can see part of the dense forest that the Amboro National Park protects. The inhabitants of the community say that its biodiversity is at risk. For decades, the park has been one of the favorite sites for timber traffickers. San Carlos is part of the province of Ichilo, and is one of seven municipalities that surround the protected area. The peasant communities that live in this area are fighting against the pillage of their trees, in particular the mara (Swietenia macrophylla King), a species also known as mahogany. They are demanding more control activities. The three operations undertaken each year in the park are insufficient. Víctor Hugo Chávez, Director of Productive Development and Environment in the office of the mayor, says that the inhabitants of the communities are constantly "seeing the callapos (timber) pass by on the river or on heavy vehicles." The official acknowledges that the interventions are difficult, often requiring a five-day hike to reach the sites where the traffickers set up their camps. The mahogany trees are logged in these remote areas and the trunks are then transported from the Colorado River to the Yapacaní River, and on to the northern part of the protected area. 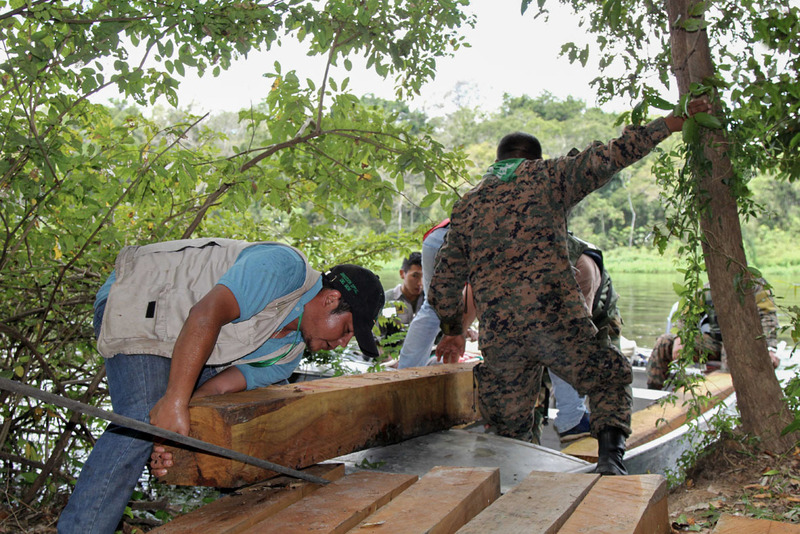 “What usually happens during the operations is that the illegal loggers have their spies and as soon as they see the patrol of park rangers, they sink the timber in the river so that it cannot be discovered,” says Chavez. Each year they seize 13,000 board feet of illegal timber in the municipality of San Carlos alone. This has been going on for almost 15 years. “They obtain between 1000 and 1500 board feet from each mahogany tree,” Chavez explains. CONFISCATION. 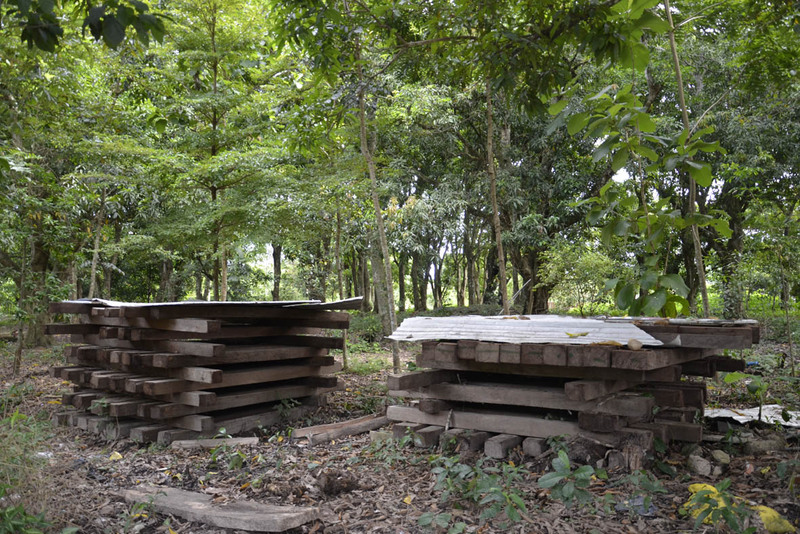 Confiscated timber deposited in the Yapacaní mayor's office. The official calculates that as each board foot sells on the local market for between 10 and 12 bolivianos (US$1.30 to 1.70), 1500 board feet from a mara tree can earn between 15,000 and 18,000 bolivianos (around US$2500). A profitable business. San Carlos Municipality officials acknowledge that a lack of resources prevents a frontal assault on illegal activity. The Bolivian Forest and Land Audit and Social Control Authority (ABT), which undertakes on-going patrols outside the Amboro National Park and supports the work of park rangers within the protected area, has a similar complaint. Its biggest challenge is dealing with the better organized groups of illegal loggers. 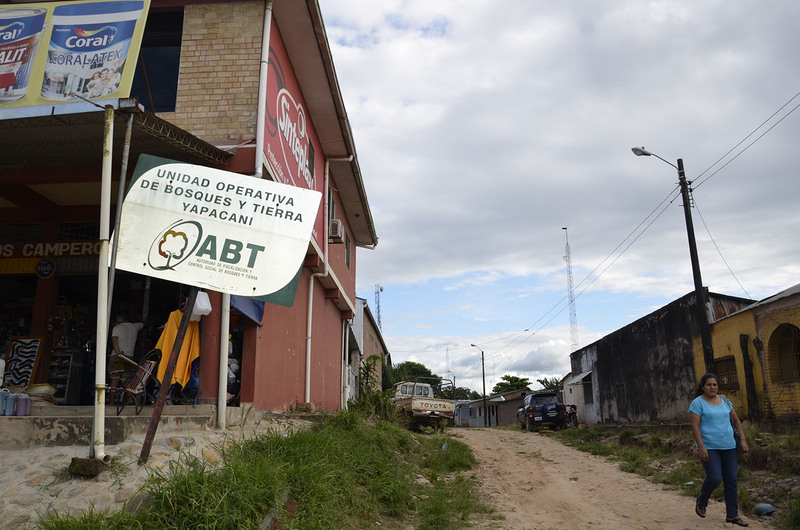 Yhoban Salguero, head of the ABT’s operational unit in Santa Fe de Yapacani (a village covered by the municipality of San Carlos), claims that unlike the park rangers, the traffickers of timber are often armed with shotguns. Abel Mamani, Director of the Protected Areas Service (SERNAP), is well aware of the situation. He confirmed in an interview for this investigation that Bolivia’s protected natural areas have become the target of timber traffickers. “There is plundering of trees, plants and animals. The indiscriminate and illegal felling of trees within and outside protected areas is continuous. We receive persistent complaints from the communities,” he said. Although the SERNAP head did not specify which of the 22 national protected areas are the most affected, he did say that complaints about illegal extraction most often originate in the following parks: Amboró (Santa Cruz), Madidi (La Paz), Pilón Lajas (Beni), Tipnis (Cochabamba-Beni), Aguaragüe, and Tariquía (Tarija). Yhoban Salguero added that the lack of resources is compounded by a lack of regulations that punish illegal logging. Under current legislation the penalties for the practice are administrative rather than criminal. Salguero believes that the possibility of a prison sentence could make a difference in the fight against timber traffickers. Reports of timber trafficking are common in Amboro. The presence of considerable volumes of mahogany, cedar and tajibo, among other valuable timber species, means this site has always been threatened by illegal logging. “Mahogany is located in just a few micro-regions, such as the Amboro Park,” said Jorge Landivar, Director of the protected area. 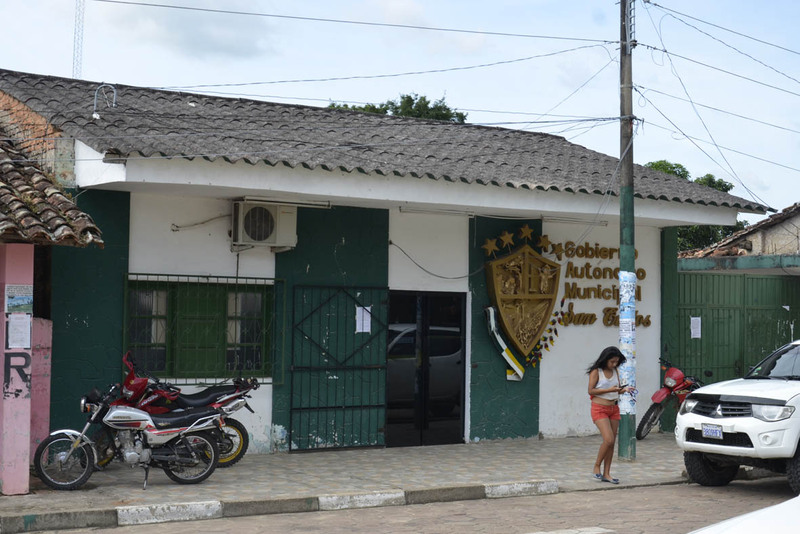 By the close of this edition ABT’s main office in Santa Cruz had not responded to a questionnaire we had provided for this investigation about its timber trafficking control operations. The ABT’s Executive Director and the Environment Ministry had also failed to respond to our requests for interviews. Under current legislation the penalties for the practice are administrative rather than criminal. The most worrying issue at present for authorities is the additional problem of drug trafficking. This illegal activity is increasing in parts of the Bolivian Amazon where the fight against illegal logging continues. During their interventions in the forests of the protected area ABT staff from Santa Fe de Yapacani have discovered maceration pits and illicit coca-leaf crops. By including the Amboro National Park on its list of the six protected areas in Bolivia most affected by illegal coca cultivation in 2017, the last Annual Report on Coca Monitoring published at the end of August by the United Nations Office on Drugs and Crime (UNODC) confirms this information. Authorities are surprised that neither drug trafficking nor the fall in the international price of timber has deterred Bolivia’s illegal loggers. This is confirmed by the confiscation of 2,114 cubic meters of sawn timber in five macro-regions during 2017 (amount that would fill the 80% of an Olympic-size swimming pool), a figure that exceeded the amount reported a year earlier by 6%. Where does bolivian Timber go? The 2014 Operation Amazonas II implemented in Bolivia and 12 other countries of Central and South America revealed the full extent of illegal timber trafficking across the entire Amazon. During the intervention more than 53,000 cubic meters of illegal timber were seized and the timber is greatest demand was identified: pine, cedar, laurel, black rosewood, and large-leaved mahogany. Most are protected species. Operation Amazon II confirmed the use of false documents to transport, trade and launder timber. 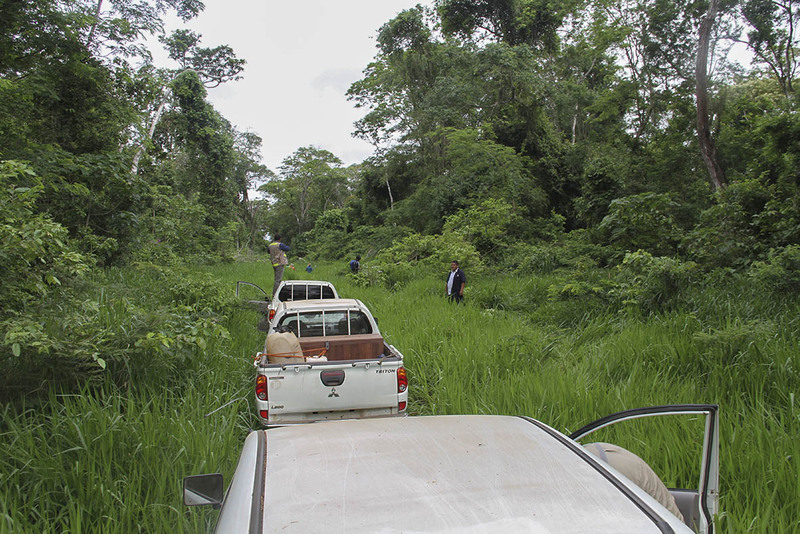 In Bolivia the trafficking begins when dealers declare more trees than they actually have, i.e., they record a greater number of trees than the number contained in the authorized forest management area or in the logging plans. Why? So they can top up their timber consignment with illegally extracted timber from prohibited areas. Walter Andrade, Director of the La Paz Forestry and Environmental Police (POFOMA), claimed that timber traffickers falsify the Forestry Origin Certificate (CFO) in order to trade their illegal cargo. “They transport the wood with false CFOs or do not carry them at all,” says Andrade. He said that when the forestry police officers undertake their operations they are often surprised that many loggers do not have the certificate and as a result are able confiscate the entire cargo. He added that sometimes following a seizure a third party mysteriously comes forward to provide a CFO. “We do not accept it. We still confiscate the cargo and report it to the ABT,” he said. Andrade argues that better control would be possible if ABT provided his agency with information on the number of many forestry origin certificates it issues. He nominated the north of the department and the municipalities of Ixiamas, Mapiri, and Palos Blancos as the areas where this measure would be most effective in dealing with the traffickers. Last year the ABT confirmed that the five macro-regions hardest hit by timber trafficking in Bolivia are Santa Cruz, Tarija, La Paz, Beni, and Cochabamba. The first one houses the Amboró National Park. Although we attempted to obtain current figures on the percentage of timber that comes from this illegal activity, no recent studies that analyze the problem in Bolivia exist. The Mother Earth Authority—an entity attached to the government—is the only one to have made an official estimate. It claims that 40% of deforestation in the country is illegal, although the figure is based on general forest lost. The principal destinations for Bolivian timber are China, the United States, and Brazil. 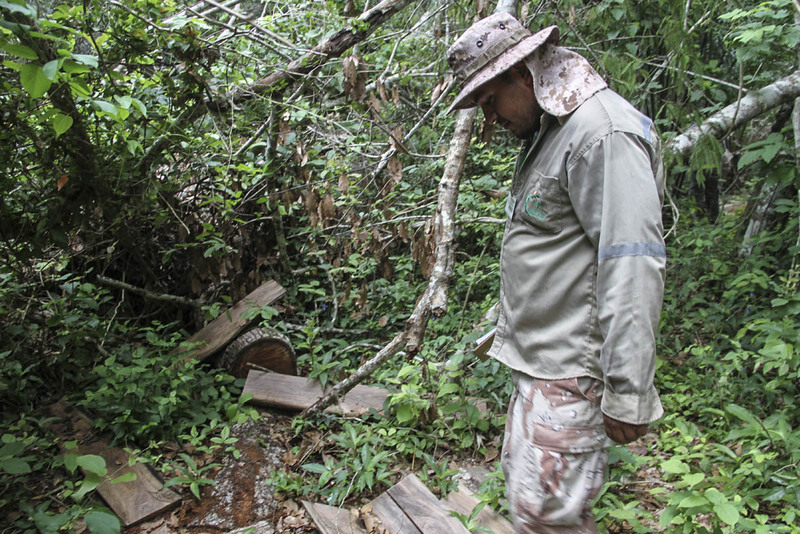 This situation worries Jorge Ávila, President of the Bolivian Forestry Chamber. He fears the impact of this illegal activity on the formal timber industry. “Informality is an unfair competitor. It destroys us,” he says. In 2011 Bolivian timber exports started to decline, reducing by approximately 50%. Jorge Ávila commented that despite a subsequent recovery, by 2017 they still remained negative. The timber trade union claims that in 2013 it had warned the government of a coming crisis, which came to pass in 2014 with a decrease in the number of productive units from managing 15,000 to just 5,500—a loss of more than one-third. The President of the Forestry Chamber noted that Bolivia’s certified forests fell behind even during Bolivia’s economic boom: the country’s 2.2 million hectares of certified forests has now reduced 800,000 hectares. The reduction in certified forests has damaged timber sector exports because markets such as the European demand certification. The principal destinations for Bolivian timber are China, the United States, and Brazil. However, a closer looks shows a fall in volumes and earnings. The National Institute of Statistics shows a drop in exports from US$69 million in 2012 to only US$51 million in 2017.